We are always ready welcome volunteers for the exciting WorldGenWeb project. One of the openings is as a Country Coordinator for this country. If you have an interest in helping us develope this valuable resource by volunteering to serve as the Country Coordinator, please contact the Regional Coordinator. The long narrow strip of central America, known in its entirety to the Spanish as Guatemala, is among the earliest of colonial conquests on the mainland. Pedro de Alvarado, a leading member of Cortés' small party in the conquest of Mexico (1519-21), is sent south in 1523 to subdue the smaller area now known as Guatemala. In 1524 he pushes on into El Salvador. In the same year Spanish conquistadors enter Costa Rica and Nicaragua from the east, invading from Panama. Honduras, the buffer region between east and west, is disputed between the rival groups of Spaniards. An advance guard from Panama gets there first. Cortés sends a force from Mexico, which eventually prevails. These rivalries persuade the Spanish crown to treat central America as a special case. In 1539 it is established as the captaincy general of Guatemala. This is part of the wider viceroyalty of New Spain (administered from Mexico City) but the captain general, operating from his own capital at Antigua, has considerable autonomy in local affairs. The arrangement survives until the end of the colonial period (except that the capital moves to Guatemala City after Antigua is destroyed by an earthquake in 1773), and it is this larger region of Guatemala which declares independence on 15 September 1821 - just three weeks after neighbouring Mexico, under Agustín de Iturbide, has won freedom from Spain. Recognizing the forceful leadership of Iturbide, the colonists of Guatemala offer to merge their region in 1821 with Mexico - uniting as one nation the previous viceroyalty of New Spain. The link holds when Iturbide makes himself emperor, in 1822. 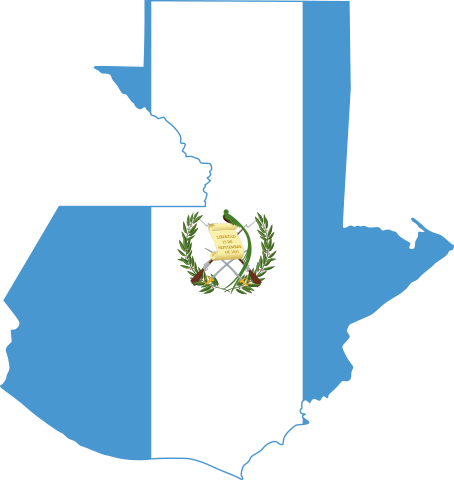 But with his sudden fall and flight from Mexico, in 1823, Guatemala decides to assert its own independence. The region from the southern border of Mexico to Panama now declares itself to be a new nation. It is to be known as the Central American Federation, with its capital in Guatemala City. The transition to statehood is far from smooth, for the other constituent provinces of the old captaincy general of Guatemala (El Salvador, Honduras, Nicaragua and Costa Rica) have intentions which are often at odds with the central government in Guatemala City. And even when established, the new nation is soon in political chaos. There is almost permanent civil war between Liberal and conservative factions. The dominant figure is the Honduran general Francisco Morazán, who is president from 1830. He attempts to introduce liberal reforms, but by 1838 the federation is in such chaos that it has effectively ceased to exist. The five regions carry on as independent nations. The first century of Guatemala's independence provides a series of four prime examples of the caudíllo as the classic Latin American dictator. The first is Rafael Carrera, an illiterate mestizo who with the support of the Indians and the rural clergy topples in 1840 the liberal government of Francisco Morazán. Profoundly conservative in his attitudes, Carrera restores the privileges of the colonial period. He favours the church and the landed classes, and brings the Jesuits back into the life of the nation. Declaring himself president for life in 1854, he dies in office in 1865. If Carrera has epitomized the conservative thread in Latin American tradition, the next caudíllo in Guatemala is an equally characteristic liberal (see Liberal and conservative). Justo Rufino Barrios is one of a group of liberals who seize power in a revolution in 1871, and in 1873 he becomes president. The dramatic changes which he introduces over the next twelve years win him the title 'the Reformer'. Barrios dismantles most of the antique structure which his predecessor has painstakingly reassembled. He expels the Jesuits again, closes monasteries, seizes church property, curtails the power of the aristocracy and sets up a system of secular education. His economic policies are equally liberal, opening up the country to foreign investment. Like the previous liberal ruler of Guatamela, Francisco Morazán, Barrios is a keen enthusiast for the union of the central American republics. Failing to make any diplomatic headway, he tries to prevail by force. In 1885 he invades neighbouring El Salvador and is killed on the field of battle, at Chalchuapa. The next two caudíllos in Guatemala's quartet are again technically liberals, but dictatorial rule characterizes their regimes rather more than any trace of idealism. Manuel Estrada Cabrera, president from 1898, keeps himself in office by a succession of rigged elections while building up a personal fortune at the nation's expense. The congress in Guatemala City finally gets rid of Estrada Cabrera in 1920 by declaring him insane (he dies four years later in gaol). Last in this sequence is Jorge Ubico, a general who becomes president in 1931. He enjoys the nickname Tata (father), and is popular with the Indians whose lot he undoubtedly improves. But he runs a police state, in the manner being brutally perfected around the world by other more powerful dictators at this period. In his formal suspension of free speech and of a free press, in June 1944, he goes a step too far. He provokes a general strike which rapidly leads to his resignation and flight abroad. SOURCE: Gascoigne, Bamber. “History of Guatemala” HistoryWorld. From 2001, ongoing. Guatemala - a mailing list for anyone with genealogical interest in Guatemala. should be directed to the NorthAmGenWeb Coordinator.